Just select the combination of Furler and Sail that best suits your type of sailing and budget. All sail and furler combinations are discounted and are normally in stock - ready to ship immediately. All package prices include both the sail and furler but not peripheral hardware such as lead block and furling line kits or replacement headstays that might be needed. Order Furling Accessories separately as needed. When you order a new Mainsail, Storm Sail or Cruising Spinnaker with your furling package you’ll get a 10% discount on that sail too! If there are NO white caps on the water more than half the time (winds about 13 knots or less) then a 140% - 155% Furling Genoa is best. If there ARE White caps on the water half the time (average wind range 14 - 20 knots) then 125%-135% a Furling Genoa is best. If there are whitecaps on the water MOST of the time (for example 18+ knots) such as in SF Bay, Hawaii or the Caribbean then a 90% - 110% Working Jib or “Blaster” Jib work best. These sails are built heavier and somewhat flatter for this purpose. UV Cover- All our furling sails have a UV cover on the leech and foot to protect it from the sun. Most stock sails have a white UV treated Dacron cover since it is a universal color. However we do stock some of our more popular sails in various colors of Sunbrella. These are listed in the “Sail Features” Column in the search results. Foam Luff Pad - A foam luff pad is an upgrade on some sails to help flatten and give better sail shape while reefed. This allows you to run a larger sail on the furler and still reef it down to a small one without it becoming too baggy. 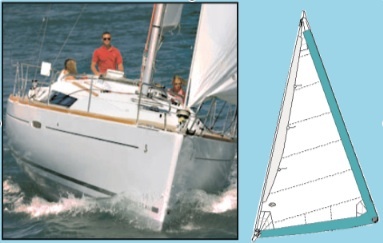 Flatter shape helps the boat stand up and drive forward with less heeling. Check the “Sail Features” column in the search results for sails with this feature. Standard OEM for boats up to 28’ used in daysailing and light cruising. Coastal Cruising for boats up to 44’ used in average conditions. Offshore Performance for boats of any size used in performance and demanding applications. Product Code - Each sail is listed in the search results coded by it’s luff length. For example a product code “RF30.0” has a 30’ luff length. Using this you can perform a Sail Search by luff and locate that sail to see every detail of it along with comparably sized sails Note, any other sail may be substituted in a discount package to meet your specifications and the cost is adjusted accordingly. Fully custom sails are also eligible for discounts too. The Flexible Furler is the simplest and least expensive type. It is suitable for boats up to around 40’ and very popular on smaller boats and trailering because of its nearly indestructible plastic luff extrusion. Profurl units are well known around the world as reliable coastal and offshore cruising units. Easy installation is a big advantage as this unit normally installs right over your existing headstay without cutting it. The drum can be mounted low for performance or high for visibility and better anchor clearance. *Disclaimer: We have researched the compatibility of all the furler and sail combinations for the boats listed in the search results to the best of our abilities. Most of the time we find the packages are correct for the boats they are listed for. However no guarantees can be made they will fit your boat exactly due to variables outside of our control. If you have any question about whether a furler and sail combo will fit properly on your boat we recommend measuring the pin to pin headstay length as described on the Furling Systems - Ordering Information page. Then use the Luff Calculator make certain the luff of the package sail will fit. We are happy to help with a recommendation if you call us with the pin to pin length.